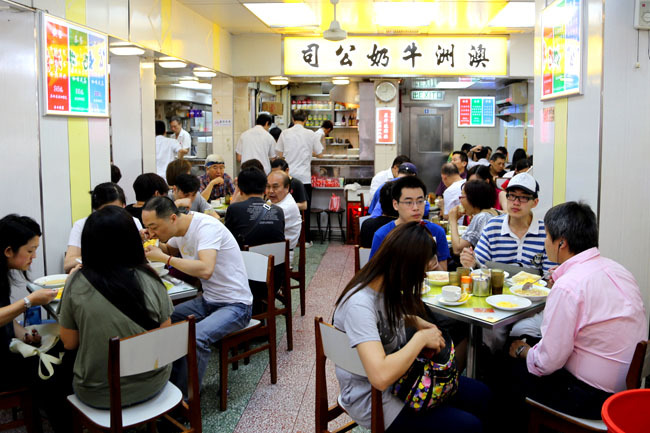 [Hong Kong] At one of Hong Kong’s most popular and famous Hong Kong café (Cha Chaan Teng) Australia Dairy Company, expect attitudes, partly rude service, chaotic ambience, long queues, and a very good plate of scrambled eggs. This is my fourth visit to Australian Dairy Company at Jordan, the first three times they were closed. Lesson learnt: Come early to queue, don’t come during the first 8 days of Chinese New Year, and don’t come on Thursdays. At about 8am in the morning, there were about 20-30 odd people in front of us, but the line cleared swift and fast. Come alone and you are likely to get a seat pretty soon. It took us about 15 minutes to get in what we describe a ‘café war zone’. What’s the deal? “You mean that’s all they sell?” my friend exclaiming very puzzled, hoping there was a larger variety like what the other Hong Kong cafes offered. 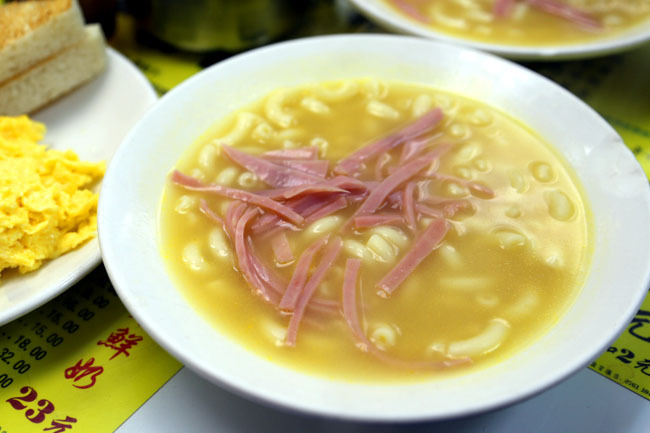 The morning set at HKD$28 consisted of a buttered toast, scrambled eggs, macaroni soup with ham and coffee or tea. The lunch set at HKD$33 offered similar items and had spaghetti with char siew. Rule of thumb: Don’t be fussy, don’t appear lost and just order. If not, you may get scolded something in Cantonese. We mumbled something in bad Cantonese. But the old waiter knew exactly what we wanted, quickly disappeared and returned throwing plates of scrambled eggs and toast on our tables – all happening in a span of 20 seconds. I am not sure to describe them as rude, plain busy, or just super at ease with customers. It’s a matter of perspective. And yes, the buttered toast was soft and aromatic, and eating it with the famed scrambled eggs in the middle is just evidence at how the simplest food on earth can taste so blissful. The eggs are fluffy and tasty, some say the secret ingredient is canned cream soups, while I also heard Hokkaido milk. I think frying it on high heat in the Chinese stove makes all that difference. Never mind if the sweat of the person frying seems to be dripping downwards. You won’t want to see. “You mean we woke up so early just to have this?” This same friend could not understand the fuss behind Australia Dairy Company. He says that even the Cold Steamed Milk Dessert (HKD$17) was milkier and smoother over at Yee Shun (just a street away). But the breakfast over there was nothing to shout about. The very moment we finished our desserts, we were hurried out. 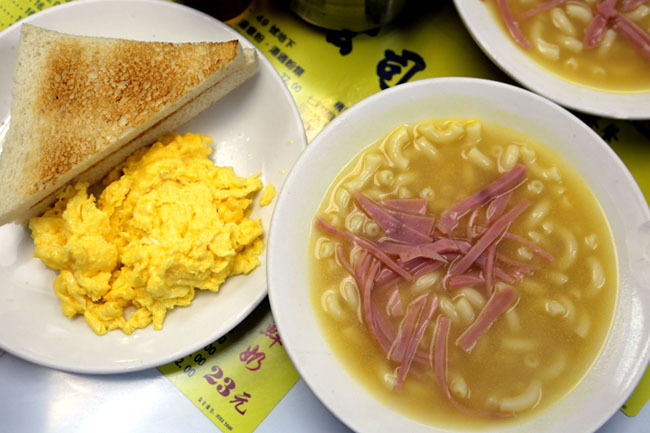 I left feeling satisfied, that I tasted one of the best scrambled eggs toast in Hong Kong, and went through the fanatical cha chaan teng experience. “throwing plates of scrambled eggs?” a little exaggerated la, they just put it down loudly =P. Nevertheless, even if they throw it down, I will gladly eat that! The scrambled eggs and Steamed Egg White Pudding with Milk are awesome! I went there 3 times during my 5 day trip to HK 2 years ago. I could almost see my plate of egg fly! lol. 3 times during 5 days. Woh…. although my friend says Yee Shun has better pudding! I tried Yee Shun Milk Company 義順牛奶公司 too. Their Steam Milk in Two Films and Steam Milk with Ginger Juice. Personally prefers Australian Dairy Company version. The scrambled eggs are awesome, especially if you, like me, has actively searched for “actually good” scrambled eggs in Singapore. 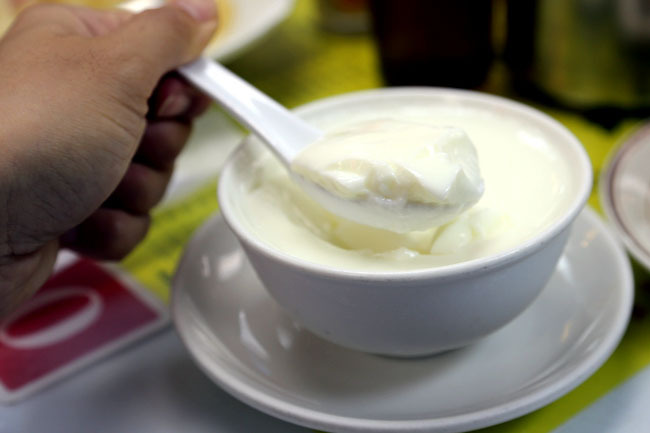 As for milk puddings, I’ve made it a point to stop by in Hong Kong every year for Yee Shun (and a few other places) since my first try back in 2004. I have to say it’s not as good as back in the heyday. I’m preferring Australian these days, though. Oh Hi Levin, thanks for dropping by. Like your blog. 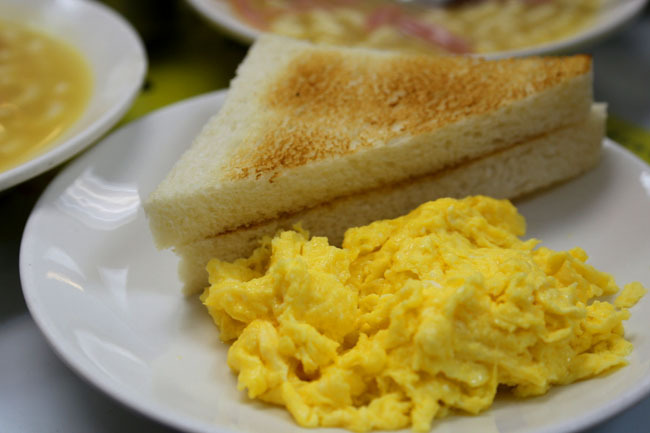 So which is scrambled egg in Singapore is “Actually good”? This is one of the places that we have a love and hate relationship while working in HK! Will always need to succumb to being a ‘Food Nazi’ so I usually have it to go. Personally I think I second FoodieFC’s comment that Yee Shun isnt quite as good in terms of the depth of flavours though arguably I find Australian Dairy’s steamed egg white pudding too sweet for my palate. The scrambled eggs on toast are really good though and I have to agree that the service is terrible if not horrendous. Try having a seat at one of the tables on the inside of the eatery near the entrance of kitchen, and you could hear a bombardment of plates being thrown, hard, into the collecting bucket! I think that’s where I sat… near the kitchen. Yee Shun’s breakfast was close to horrendous I thought… hahaha. but their milk was really creamy smooth. We've just finished a new post about great desserts we've tried in Hong Kong. 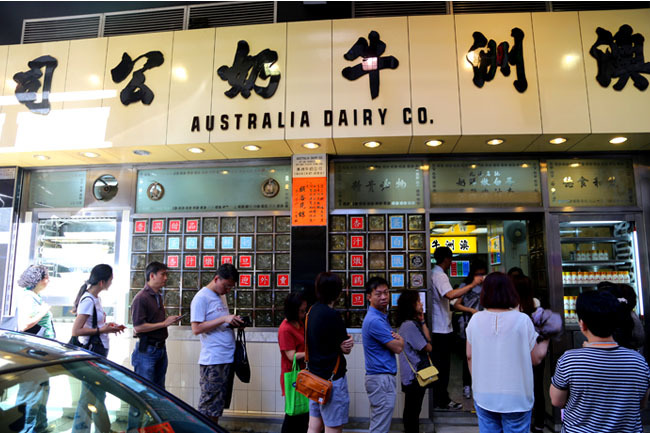 Do try out the <a href="http://2bearbear.com/great-desserts-at-australian-dairy-company-hong-kong-%E6%BE%B3%E6%B4%B2%E7%89%9B%E5%A5%B6%E5%85%AC%E5%8F%B8/">steamed egg puddings at the Australian Diary Company</a> when you're in HK yah?! I’ll definitely not going bk to ADC anymore, feel sorry for the boss for having such a lousy employee.